QUESTION: -- four U.S. official deaths, meaning the three were dependents? MR. CROWLEY: Three were dependents. MR. CROWLEY: Yeah, they’re part of the official – they were there in an official status as accompanying family members in Haiti. MR. CROWLEY: But they’re not – obviously, they’re not U.S. employees. MR. CROWLEY: They’re children or spouses of. QUESTION: Four Embassy workers, State Department people? I did not realized that the dependents killed in Haiti were all family members of one employee. State Department employee Andrew Wyllie who was working for the United Nations in Haiti lost "his wife on her birthday and his seven-and-a-half and five-year-old children," according to Secretary Clinton. My heart is full of sadness. Please keep him in your thoughts and prayers. Andrew Wyllie's wife Laurence and his two young sons Evan and Baptiste were lost in the disaster. Click here for the official statement from the State Department. 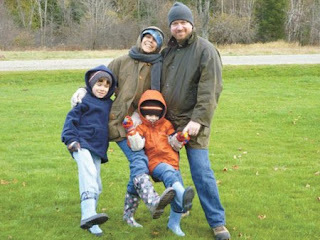 Andrew Wyllie with wife Laurence and children Baptiste, five, front right, and Evan, seven.